There are 3 types of F35, the UK will take the F35B. F-35A conventional take off and landing (CTOL) variant. F-35B short-take off and vertical-landing (STOVL) variant. F-35C carrier-based CATOBAR(CV) variant (non-vertical). The JSF or F35 Lightning II is the aircraft that most western oriented air forces are expected to buy. It is a small-medium sized, stealth shaped aircraft in 2 main versions; a conventional take-off and a short/vertical take off. The aircraft is also known as the Joint Combat Aircraft in the UK. The UK originally participated in the development programme based on a commitment to buy and its Harrier vertical take-off technology experience. It then took on development of some systems, parts of the airframe and a version of the engine through Rolls Royce. The UK is the major partner to the US in the project, the only Level 1 partner. Lockheed Martin are the prime contractor while BAE SYSTEMS and Northrop-Grumman are principle partners. For the UK the aircraft will replace the Harrier and the Tornado. As it is primarily an American aircraft and countries all over the world are participating it has never seemed to be the sort of project that gives the UK much industrial credibility. Although 3 aircraft are being bought to enable UK participation in the test programme. The aircraft is called a 5th Generation type which includes: low observable, supersonic, enhanced data fusion. In the UK operation will be by a joint service team from the RAF and RN, lead by the RAF. The link to Preston is that the BAE Systems workshare is based at Warton with Samlesbury being the manufacturing plant. Samlesbury will manufacture rear fuselage and vertical and horizontal tails for all variants of the aircraft. The F35B is based at RAF Marham operated by 617 Squadron. January 2019 UK declared Initial Operational Capability. October 2018 F35 makes night-time landing on carrier HMS Queen Elizabeth. November 2016 The Ministry of Defence announce that the UK has been chosen by the F-35 Program Office to be a global repair hub providing maintenance, repair, overhaul and upgrade services for F-35 avionic and aircraft components. Over the lifetime of the programme, components for hundreds of European-based F-35 aircraft will be serviced and maintained at Sealand in North Wales. July 2016 Two F35B STOVL version aircraft will begin the last phase of carrier based flight testing on USS America in October 2016, prior to trials on the UK QE class carriers. - 17(R) Squadron at?Edwards Air Force Base in the US, F-35B Operational Evaluation Unit. - 617 Squadron at?RAF Marham, first operational RAF F-35 unit in 2019. - 809 Naval Air Squadron, RAF Marham. - 2 more frontline Squadrons and the Operation Conversion Squadron will also be formed. June 2014 UK takes the 3rd JSF an F35B at Eglin Air Force Base. February 2014 the BBC reports the UK will initially order 14 aircraft plus support packages which will be for the entire planned fleet. October 2012 UK takes 2nd F35B at Eglin Air Force Base. 19th July 2012 The UK accepted its 1st aircraft, an F35B, one of three ordered for testing. The STOVL aircraft was 'delivered' at Fort Worth in Texas and will remain at Eglin Air Force Base for testing by UK pilots. It is planned to be operational by 2018. The UK is expected to order a 4th aircraft for evaluation. May 2012 The UK government announces it will revert to the F35B type due to escalating cost and risk associated with the new arrestor hook type on the carriers. March 2012 The F-35 manufacturing facility as Samlesbury was opened. When it is fully completed it will enable production of one F-35 aft fuselage every day. The programme is building up to peak rate production by 2016. February 2012 There is debate about whether to revert to buying the short take-off / vertical landing version, the F35B, due to the cost of the arrestor gear on the carriers required for the F35C carrier version which has conventional take-off and landing. March 2011 the Daily Telegraph reports that the UK is still re-negotiating the contract for 3 test aircraft which will be the F35B variant, the type the UK is no longer buying. The MoD say the test work will benefit the F35C. October 2010 the UK Strategic Defence Review announces that the UK will purchase only the conventional take-off version, the F35C carrier version which has conventional take-off and uses an arrestor hook at landing. The cost of converting the aircraft carriers for this is very large. 18th March 2010 - The date of the first Vertical Landing of the F35B at Patuxent River in Maryland. BAE SYSTEMS test pilot Graham Tomlinson successfully sat on 41,000lbs of thrust to land the aircraft in a 95ft square. The engine is a Pratt & Whitney F135 driving a Rolls-Royce LiftFan?. This completed the first ever vertical landing of the short take off vertical landing (STOVL) variant of the Lockheed Martin F-35 Lightning II (also known as the Joint Strike Fighter) at Naval Air Station Patuxent River. ?Watch the landing on YouTube. November 2009 - First STOVL version arrives at Patuxent River Naval Base for ground and flight testing. March 2009 - The UK announced the purchase of three F-35B Lightning II operational test aircraft. This is said to signal the U.K.?s commitment to the Operational Test and Evaluation phase. April 2008 - BAE SYSTEMS cut metal for first production aircraft rear fuselage. This was actually at a sub-contractor, Hyde in Manchester, prior to the items being shipped to Samlesbury. January 2008 - Low Rate Initial Production contact for rear fuselages and empennage awarded to BAE SYSTEMS. April 2007 - First aft fuselage for STOVL version handed over by BAE SYSTEMS. December 2006 - First Flight of CTOL version. December 12th 2006 UK MoD signs MoU - this covers agreements on purchase and support, without commitment. It was subject to some debate as the UK stance was that their must be 'UK Operational Sovereignty' i.e. the UK must be able to operate the aircraft fully independantly. The US had declared some areas of technology too secret to share. 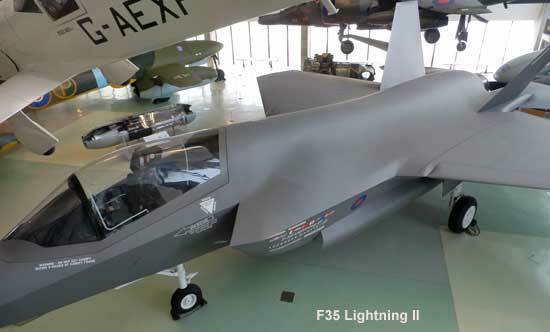 July 7th 2006 JSF named 'Lightning II' - both the UK and the USAF had a Lightning so this name suits them both. The name having particular affection in the UK. October 2001 Lockheed Martin selected JSF prime contractor with BAE?SYSTEMS and Northrop Grummen. 2000 First Flights of demonstrators. November 1996 Concept Demonstration Phase - Lockheed X35 and Boeing X32 to fly-off.